French perfume house Berdoues will launch Péng Lái, a new addition to the Colognes Grand Crus collection. The last in the series was Hoja De Cuba. This Grand Cru tells the Chinese legend of Péng Lái, the holy mountain where used to live the 8 immortals, one of them was He Xiangu, the goddess of flowers. She is often represented holding a lotus and a peach. [...] Our perfumers have put time on hold with fragrant interpretation of the Chinese legend... This Grand Cru invites you to daydream and reveals one of China's most precious flowers, the Osmanthus. Péng Lái was developed by perfumer Sebastien Martin; additional notes include benzoin and tonka bean. 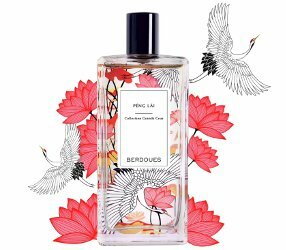 Berdoues Péng Lái will be available in 100 ml. Wow, that bottle looks gorgeous!!! I need to explore this brand some more. I tried Assam of India last year, and liked it a lot. and two summers ago I wore it for seven weeks straight! Oy, I feel a blind-buy coming on. Haven’t done that in years, but this house and those notes (osmanthus and benzoin are among my most favorite) not to mention the bottle and backstory, may prove to be too much to resist. Agree! The house does a good job at decent fragrance and nice packaging without costing the earth ( I mean price wise, not environmentally!) and it’s been a good while since I splurged. Osmanthus is usually a pretty safe thing take a chance on, right? What in your opinion is THE world-class osmanthus? I agree…the fragrances are pleasant and extremely affordable for niche. Quite often they show up heavily discounted online as well. There is not really a “gold standard” osmanthus that I know of, which is a shame. Ok, first, now that is one gorgeous bottle! Second, the part of the 8 immortals immediately made me think of the Highlander movies, and “there can be only one!” Sorry, sometimes I’m a dork???? Their packaging is gorgeous (and I love the one Berdoues I have, Assam of India), but I already have my Parfum d’Empire Osmanthus Interdite, so that’s covered. Maybe I should just buy for display purposes the empty bottles that show up on ebay?